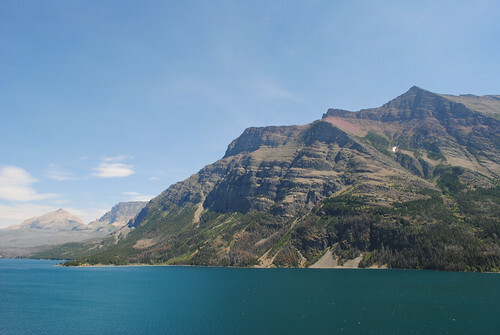 One visit to Glacier National Park was all it took. I am smitten with mountains. Since we met, J and I have always been divided on one thing: I love the ocean, he loves the mountains. However, the more we explore together, the more we’re able to see what each other sees when we explore the great outdoors. 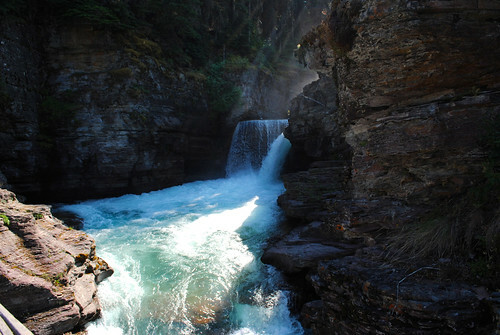 Nowhere was this more true than at Glacier National Park. 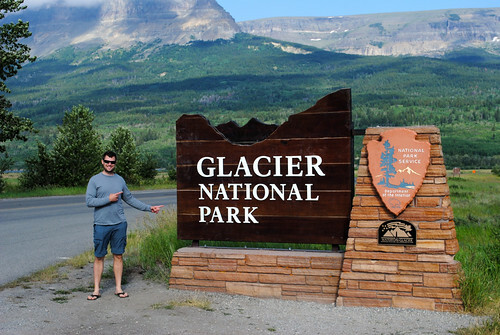 It’s true in that I was initially mostly excited to drive the famous Going-to-the-Sun Road in Montana’s Glacier National Park, the parkway made famous by Jack Torrance in his little yellow Beetle in the opening scenes of The Shining. However, as we did our research, I couldn’t deny that I was drawn by the breathtaking glaciers that dotted the park in photos. 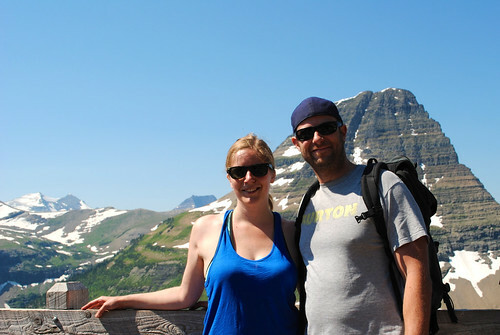 I love to hike as much as my husband does, so hitting some trails was definitely on our to-do list. 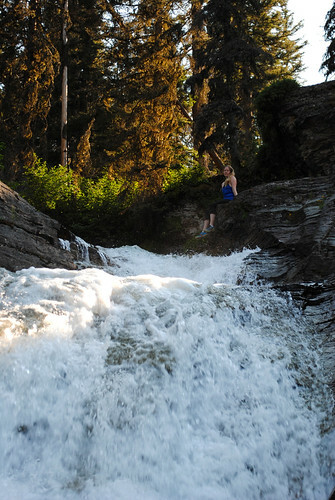 Can you spot me sitting way up at the top of the waterfall in the photo on the right? On our second day, we finally made it to Logan’s Pass. It’s one of the key visitors’ centers in the park and makes a great “base camp” for day hikes in the area. If we’d had more time, we would have loved to tackle the Highline Trail – which only serves at the perfect reason to return again some day soon. Instead we joined the masses headed for the Hidden Lake Overlook. 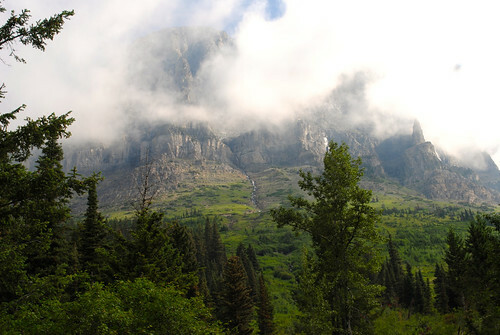 That trail continues to cascade down to the edge of Hidden Lake; however, rangers had closed that portion of the trail due to grizzly bears in the area that were feeding on spawning fish in the lake. Despite the trail closure, there was no shortage of wildlife. 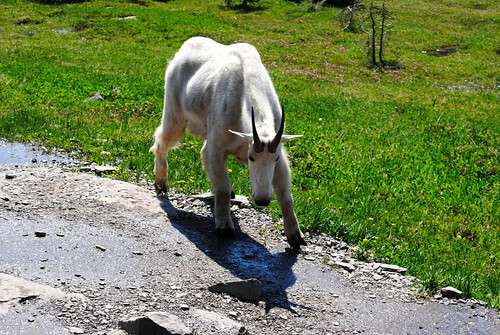 Near the crest of the trail, herds of mountain goats shared the pathway with us. While it’s crucial to stay as far away from wildlife as possible, doing so is simply impossible when mountain goats choose to walk directly alongside of you! 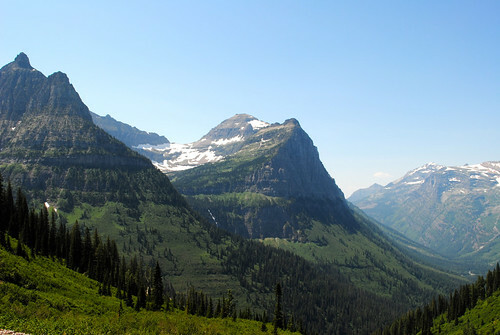 Today only few glaciers still exist in the park, and it’s estimated that by the year 2020, Glacier National Park sadly will no longer contain any glaciers at all. I can say without a doubt that driving through the park is probably the most awe-inspiring drive I have ever taken in my life. Going-to-the-Sun Road twists and turns and twists again as it winds down out of the mountains, wrapping itself along the curves of these ancient giants. 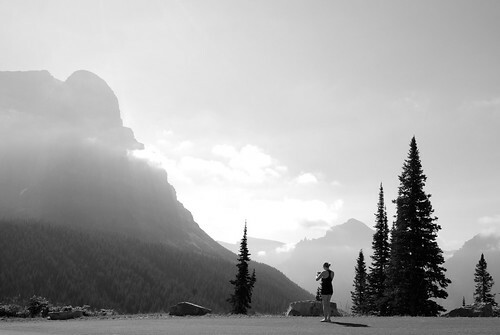 Sometimes there is no better feeling than being completely isolated in your own corner of the world, and Glacier National Park is the perfect spot to find that feeling. 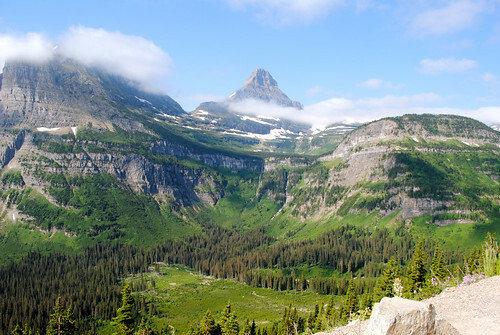 *Glacier National Park is home to black bears and grizzly bears. When in bear country, it’s vital to pay attention to all posted signs and instructions from park rangers, carry bear spray, make noise while hiking, and hike in groups of three or more. For more information, please refer to the National Park Service’s website. 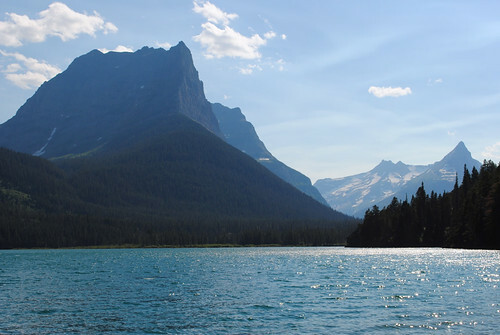 Visit Glacier National Park’s official website for park-specific details. Privacy: We were in site #3 which offered no trees, shade or privacy. People were quite literally walking through our site. Beautiful photos and great info. Looking forward to the rest of your series. Beautiful photos…i love the mountains.